Shoot ‘n Shower: Alley-Oop! Swish! Score more points than your opponent or you’ll be all wet! 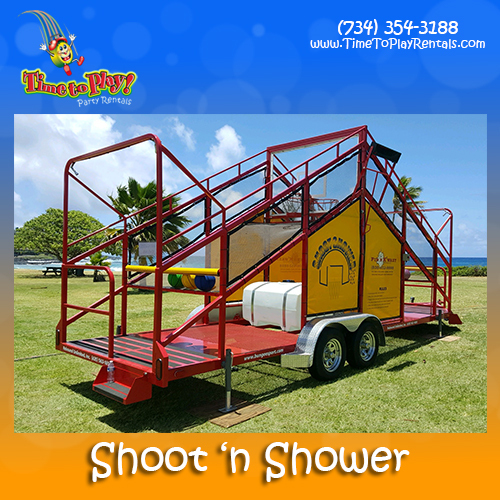 Our incredibly fun Shoot ‘n Shower game is a slam-dunk for players of all ages. Played with up to two participants on each side, the goal is to make more baskets than your opponents within 20 seconds. The Shoot ‘n Shower timer and scoreboard show the crowd the point count and time remaining. When time’s up, the players with the lowest score get SHOWERED with a mist of water! If the game ends in a tie score, both sides get SHOWERED! Even the losing team wins with this fantastically fun water game!